They are moving West and Southwest. US population growth (%) by states, July, 2013 – July, 2016. US is currently observing a significant internal migration with a very an uneven population growth. The old stalwarts of mid-west are loosing people while the sunny south-west and rainy north-west are growing more than twice as fast as the whole country. 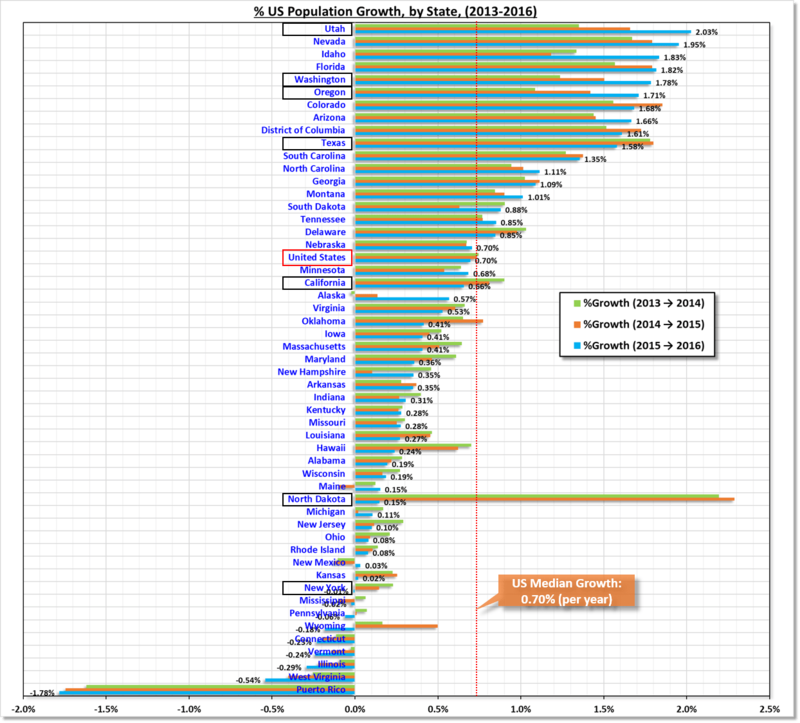 Despite not many big metros, Utah and Idaho are among the fastest growing states. Recent growth in technology has made it possible to work away from offices in big cities. Skyrocketing housing prices have forced employees to find more affordable tier-two or tier-three cities. That is clearly seen in Oregon, Washington, Colorado, and Arizona, which have seen a huge influx of young employees. On the other hand, Florida has benefited from the retiring baby boomers. The historically manufacturing-focused states of mid-west & eastern US have been shrinking as manufacturing moved to Asia and new industries haven’t provided the opportunities available before. Additionally, the fall in oil prices have halted the recent boom in North Dakota, Wyoming, and Alaska. Source: www.census.gov (data table from www.factfinder.census.gov here).